Bright or dark clouds hovering in the interstellar medium (the space between the stars) are called nebulae. Nebula, Latin for "cloud," is a visual classification rather than a scientific one. Objects called nebulae vary greatly in composition. Some are really galaxies, but to early astronomers they all appeared to be clouds. Some categories of bright nebulae include spiral, planetary, emission, and reflection. Others are remnants of supernova explosions. Cepheid variable: Pulsating yellow supergiant star that can be used to measure distance in space. Red giant: Stage in which an average-sized star (like our sun) spends the final 10 percent of its lifetime; its surface temperature drops and its diameter expands to 10 to 1,000 times that of the Sun. Stellar nursery: Area within glowing clouds of dust and gas where new stars are being formed. In 1923, American astronomer Edwin Hubble made a remarkable discovery about a spiral-shaped nebula: it was actually a gigantic spiral galaxy. Previously, astronomers had considered the Great Nebula in the constellation Andromeda to be a cloud of gas within our galaxy, the Milky Way. Hubble identified a variable star known as a Cepheid (pronounced SEF-ee-id; a blinking star used to measure distance in space) in the Andromeda nebula, estimating its distance to be about one million light-years away. This was far beyond the bounds of the Milky Way, proving the existence of galaxies outside of our own. 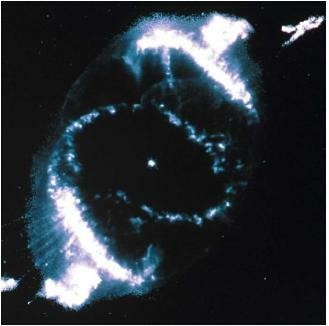 Since then, many other spiral nebulae have been defined as galaxies. Planetary nebulae truly are clouds of gas. They are called planetary because when viewed through a telescope, they appear greenish and round, like planets. Astronomers believe a planetary nebula is a star's detached outer atmosphere of hydrogen gas. This is a by-product of a star going through the later stages of its life cycle. As it evolves past the red giant stage, a star sheds its atmosphere, much like a snake sheds its skin. One of the most famous of these is the Ring Nebula in the constellation Lyra. that is 20 light-years across. Astronomers believe it to be a stellar nursery, a place where new stars are formed. Reflection nebulae are also bright gas clouds, but not as common as emission nebulae. A reflection nebula is a bluish cloud containing dust that reflects the light of a neighboring bright star. It is blue for a similar reason that Earth's sky is blue. In the case of our sky, the blue wavelength of sunlight is scattered by gas molecules in our atmosphere. In the same way, the nebula's dust scatters starlight only in the wavelengths of blue light. The final type of bright nebula is that produced by a supernova explosion. The most famous nebula of this type is the Crab Nebula, an enormous patch of light in the constellation Taurus. At its center lies a pulsar, a rapidly spinning, incredibly dense star made of neutrons that remains after a supernova explosion. Dark nebulae are also scattered throughout the interstellar medium. They appear dark because they contain dust (composed of carbon, silicon, magnesium, aluminum, and other elements) that does not emit light and that is dense enough to block the light of stars beyond. These nonglowing clouds are not visible through an optical telescope, but do give off infrared radiation. They can thus be identified either as dark patches on a background of starlight or through an infrared telescope. One example of a dark nebula is the cloud that blots out part of the Cygnus constellation in our galaxy.